Fed up with the likes of vanilla, chocolate and strawberry ice cream? An experimental entrepreneur from Bristol (in the UK) has developed a whole range of uniquely flavored ice-cream for adventurous palates looking to buck the norm. Among his range of flavors include cheddar cheese and roast beer, however it is his ‘glow-in-the-dark’ ice cream that has really raised eyebrows. Watch the above video for Eddith Widder talking about luminescence. 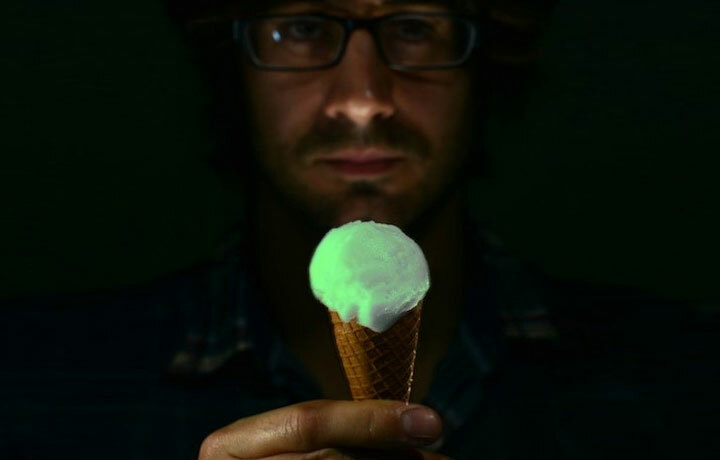 The first-of-its-kind ice cream uses a synthesized jellyfish luminescence to make it visible in the dark. It’s also interactive as the ice cream lights up when it reacts with your tongue. Pre-tongue contact, the ice cream has a neutral PH, however once it starts to be consumed, it gives off a green glow. Unfortunately, the unique ice cream comes with a hefty price tag, meaning you probably won’t see it in your average ice cream van any time soon. A single scoop will set you back a whopping £140. However, there is a reason for the high price tag. While it may look radioactive, Charlie said the taste is rather delicious and the glowing effect is limited only to the ice cream. Fed up with the likes of vanilla, chocolate and strawberry ice cream? An experimental entrepreneur from Bristol (in the UK) has developed a whole range of uniquely flavored ice-cream for adventurous palates looking to buck the norm. Among his range of flavors include cheddar cheese and roast beer, however it is his 'glow-in-the-dark' ice cream that has really raised eyebrows.